With the continuous progress of technology, we need to put less and less effort to get the things done. And it’s not only about jobs which are getting more and more computerized every day; it’s about our lifestyle in general. If in the recent past we had to wash the dishes and clean the floor ourselves, now there are people who have a dishwasher and a robotic vacuum cleaner which can do that for us. I’m not saying it’s bad to take advantage of the privileges of technology (I’m a fan of technology myself), but the problem is that, as a result, there are those of us who sometimes tend to avoid physical activity and end up sitting for more hours a day than our parents and grandparents did. Let’s take a look at some statistics. Approximately 80% of the Americans use the Internet on a daily basis, and there is at least one computer in 90 % of the homes. Of course, it’s not only about the Internet usage or home computers. Imagine how many Americans do office jobs that require sitting in a chair for at least eight hours a day. The real problem is that even after a long working day, many people continue spending their free time in front of a screen, watching TV, playing video games, browsing the Internet or chatting with friends online. 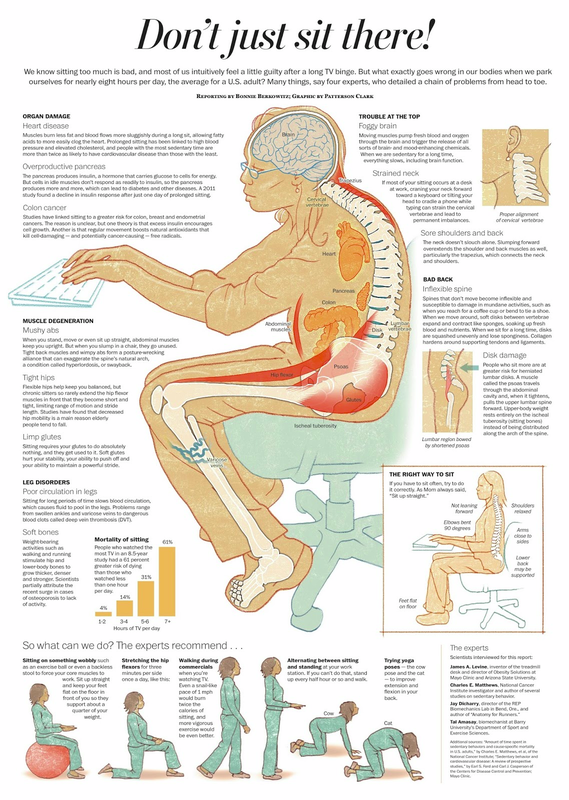 So when it comes to health problems, the statistics show that 40% of people who suffer from back issues tend to spend long hours sitting at the computer. You may think that back problems are the only major consequence of a sedentary lifestyle. Unfortunately, it’s not that simple, and recent research reveals that too much sitting is linked to a number of health problems, including obesity, heart disease and diabetes. 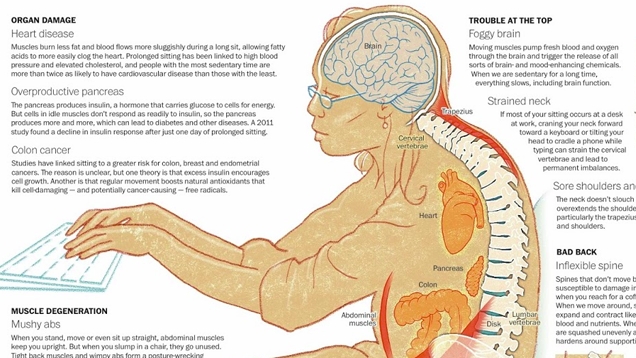 Here is an infographic that explains the health problems associated with spending too much time in a chair. There are some recommendations on the proper sitting position and exercises too.